Sterling, New York, 2013. 480 pages. If you’re at all interested in mathematics, this is a fascinating book covering the history of major developments in mathematics in the twentieth century and the start of the twenty-first, as told in the pages of The New York Times. Since the articles are from The New York Times, they are written for the general public, and the articles aren’t too lengthy. I mostly read one a day for a very long time. Incredible as it may seem, the book was never on hold when I wanted to renew it. My only complaint was that I had to learn to check the date – given at the end of each article – before reading the article rather than after, because all are reported as happening in the present – it was nice to know when the major development had actually happened in 1936 (though there are more from recent years than going that far back). Of course, having once been in a PhD program in Mathematics (though I settled for my Master’s), I was extra interested to get tastes of what’s going on before and after my time in the math department. For me, it was interesting to place the articles as before or after my time at UCLA. The articles are grouped in chapters of related articles. 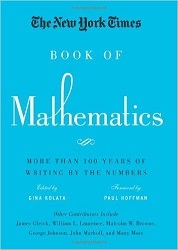 You’ll get an idea of what to expect from the chapter titles: “What Is Mathematics?”; “Statistics, Coincidences and Surprising Facts”; “Famous Problems, Solved and As Yet Unsolved”; “Chaos, Catastrophe and Randomness”; “Cryptography and the Emergence of Truly Unbreakable Codes”; “Computers Enter the World of Mathematics”; and “Mathematicians and Their World.” Try this book for a bird’s-eye view of that fascinating world. This entry was posted on Wednesday, June 1st, 2016 at 11:10 pm and is filed under Mathematical, Nonfiction Review. You can follow any responses to this entry through the RSS 2.0 feed. You can leave a response, or trackback from your own site.